Many people have a problem area in their yard that has standing water, or is soggy, and this makes it just plain difficult to mow and maintain. Luckily, Florida has many native wetland plants to choose from to solve these problems, and by incorporating several species of these in your garden, you can also provide fruit and beautiful flowers for both bird and butterfly. There are a large variety of plants for wet sites … some are larger than others, but there’s bound to be something from this list that you can use to turn your problem area into a beautiful landscape, or wildlife habitat, and not a maintenance nightmare. Try out some of these plants or identify existing plants and allow them to flourish. Trees can be started from seed and transplanting seedlings or saplings. If you learn to identify the seedlings you will be amazed at the ease at which they can be located. Most seedlings are found along fence rows or underneath established plantings courtesy of the songbirds. Some seedlings, usually oaks, can be found in the lawn courtesy of the squirrels. Transplanting seedlings is best done in the late winter spring and fall. However avoid the scorching heat of summer if you are moving a tree to full sun. Even when moving to a wet site the summer sun can create too much stress on transplants. Seedlings (about 1 foot high and just beginning to grow) will suffer the least amount of stress during transplanting and generally do not drop all of their leaves. However, saplings (six feet and several years old) will generally go into shock and drop most of their leaves. Saplings transplant best in the fall when they are dormant. If you want your tree transplants to have a single trunk do not prune branches or the central stem [trunk]. Unlike shrubs and wildflowers it will change the shape, and form, of your tree. Removing some leaves is a good idea to reduce shock and allow it to have more resources to recover from the transplanting, but do not remove all the leaves because it will need some to photosynthesize and feed itself. Boxelder is a deciduous tree reaching a mature height of 60 feet. It grows in moist woodlands and along stream banks, but also in dry sites. It grows in full sun to part shade. The buds, flowers and seeds are eaten by songbirds and mammals. The bark, twigs and leaves are eaten by mammals from gray squirrels to deer. Some trees produce only female flowers, other only male and some both making maples polygamo-dioecious. Maples are insect and wind pollinated. Boxelder is a larval food for the cecropia silk moth. Boxelder is native to all of the United States, north into Canada and south to Guatamala. Red maple is a deciduous tree reaching a mature height of 50 feet. It is a good shade tree that provides nice fall color. It grows in moist woodlands and along stream banks. It grows in full sun to part shade. The buds, flowers and seeds are eaten by songbirds and mammals. Mammals eat the bark, twigs and leaves. Maples are polygamo-dioecious which means some trees have female flowers, some male, and some both. Maples are both insect and wind pollinated. Red maple is a larval food for the cecropia silk moth. Red maple is native to the eastern side of the continent … from northern Canada south to Florida and west to eastern Texas and Oklahoma. 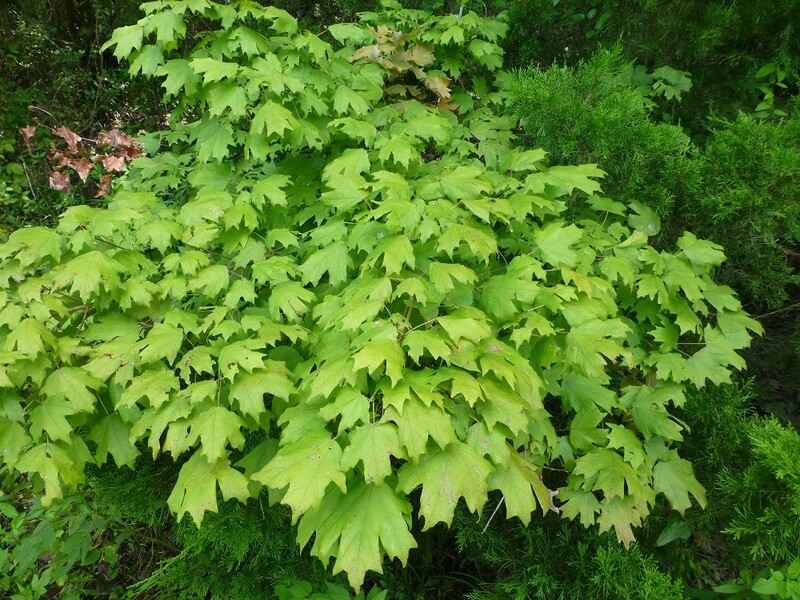 Florida maple is a deciduous tree that grows to about 50 feet in height. It is found in moist woodlands and along stream banks. It grows in full sun to part shade. Maples are polygamo-dioecious which means some trees have female flowers, some only male and some both. The flowers are insect and wind pollinated. Florida maple is a larval food for the cecropia silk moth. 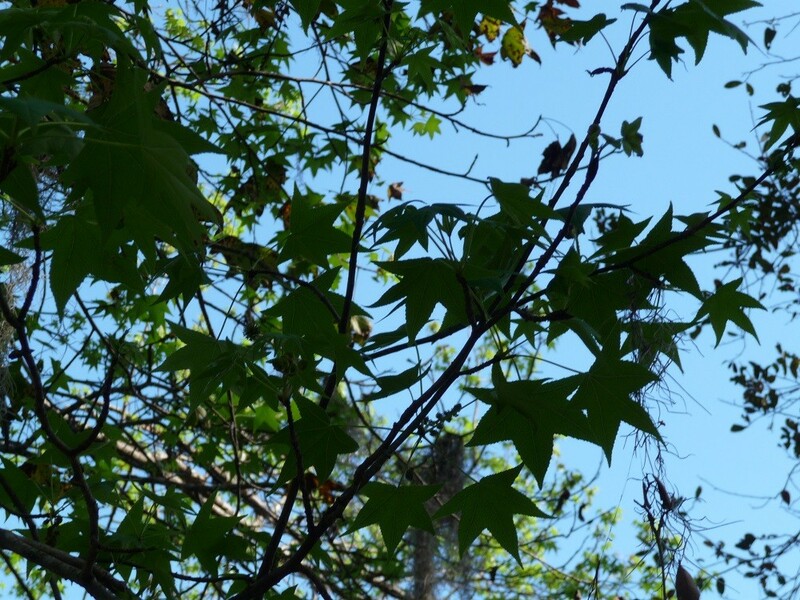 Florida maple is found scattered throughout the southeastern U.S. south in Florida to Polk county. 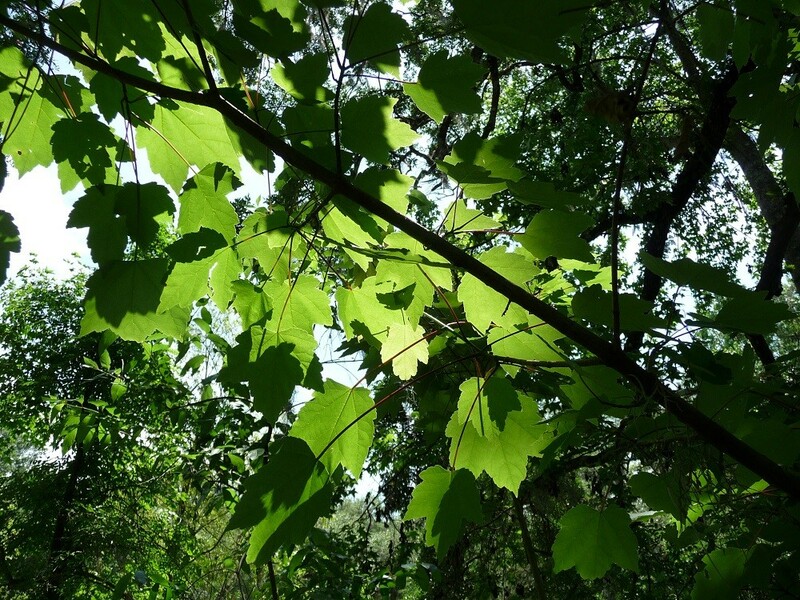 Hackberry is a deciduous tree reaching a mature height of 80 feet. It is found in dry to moist woodlands, old fields, & fence rows. It grows in part shade to full sun. Tiny flowers are produced that provide a nectar source for pollinators. Hackberry is monoecious with male and female flowers on the same tree. The flowers are followed by small orange to red fruit that are eaten by songbirds. Hackberry is a larval food for the mourning cloak, hackberry, tawny emperor and question mark butterflies. 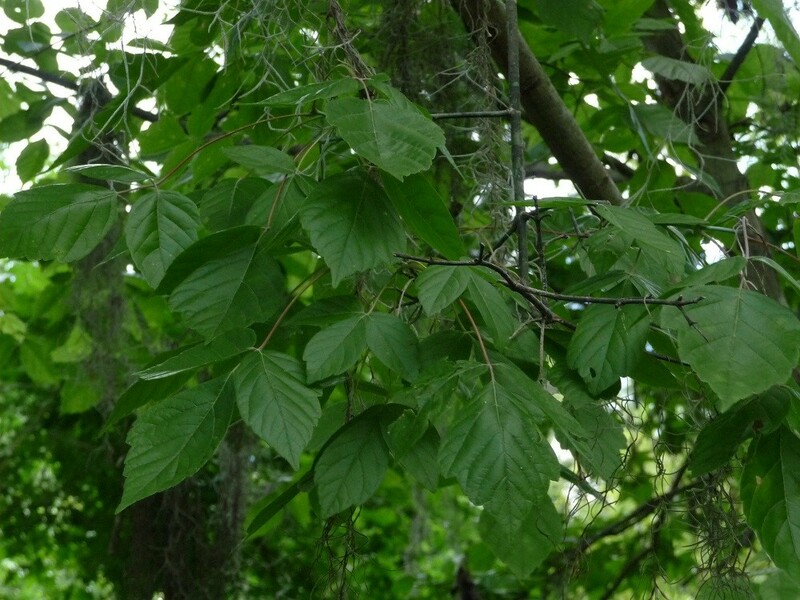 Hackberry is native to most of the United States. Loblolly bay is an evergreen tree reaching a mature height of 60 feet. It grows in swamps, bogs, and the edges of wetlands in full sun to part shade. White flowers appear in late spring and are a nectar source for many insects. 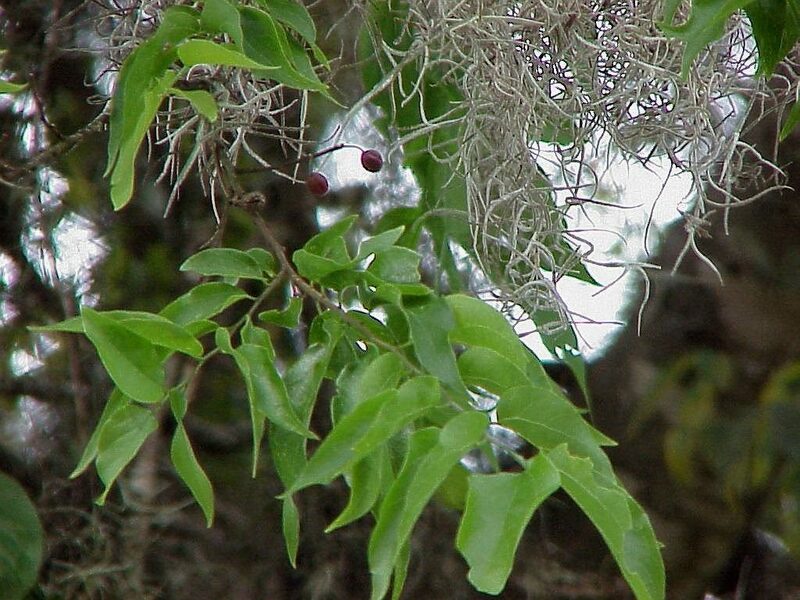 Loblolly bay is monoecious with male and female flowers on the same tree. The seeds are eaten by songbirds. 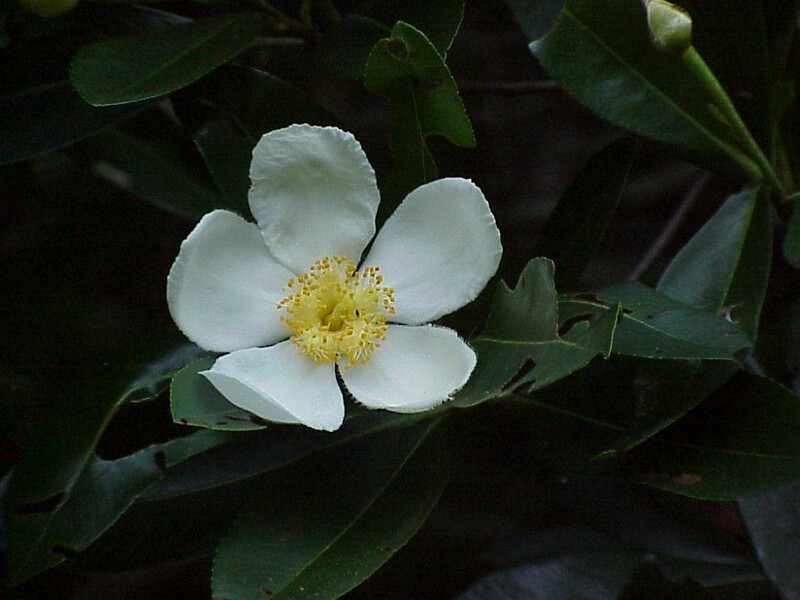 Loblolly bay is the larval food for the Gordonia darkwing moth. Loblolly bay is native to the southeastern United States. Sweet gum is a deciduous tree reaching 50 feet in height. It is found in dry to moist woodlands. It grows in full sun to part shade. The greenish yellow flowers appear in the spring followed by spiny seedpods. The seeds are eaten by birds and mammals. The seeds are an important food source for migrating gold finches. Sweetgum is a larval food for the luna moth. Sweetgum is native to the southeastern United States west to Texas and in California. Swamp chestnut oak is a large deciduous tree reaching 100 feet in height. It grows in mixed hardwood, mesic hammocks and bluffs. The flowers are inconspicuous. Oaks are monoecious with male and female flowers appearing on the same tree. The acorns are very large (1-2”) and in the white group and eaten by a large variety of wildlife. Oaks are a larval food for the banded, southern, and white M, hairstreak butterflies. 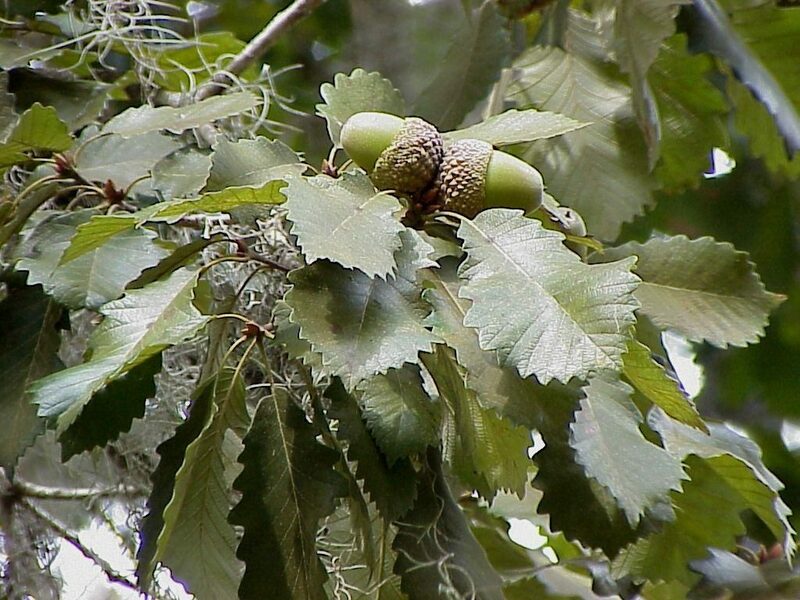 Swamp chestnut oak is native to the eastern United States north to Illinois, west to Texas and south to Florida. 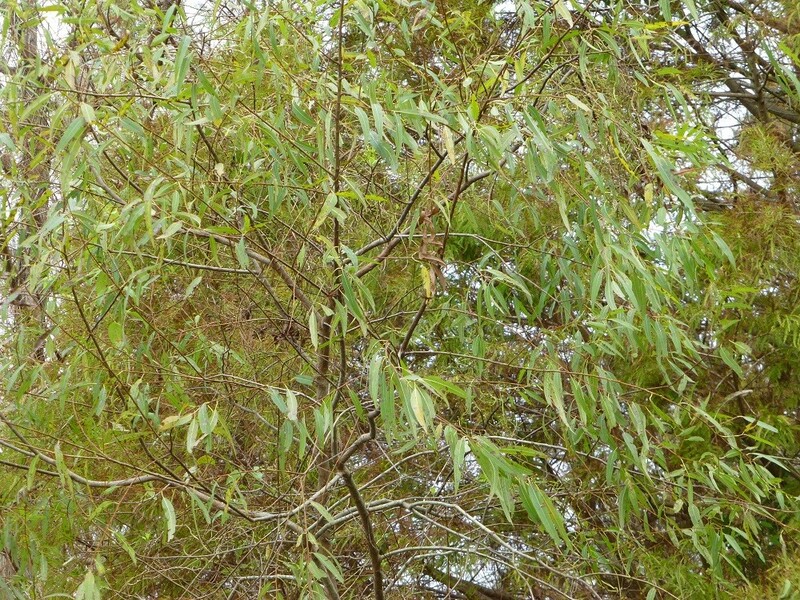 Coastal plain willow is a small deciduous tree that reaches a height of 30 feet at maturity. It grows in full sun to part shade. The flowers appear in the spring with the new leaves and attract many pollinating insects that in turn provide food for songbirds. Salix is a larval food for the viceroy, red spotted purple, and mourning cloak butterflies. Coastal plain willow is native to the eastern United States north to Illinois, west to Texas and south to Florida. Shrubs can be started from seeds, transplants or cuttings. Local sources should be your first choice as these plants are already adapted to your region. When transplanting do your best to retain as much soil around the roots as possible. If you can successfully move a shrub without disturbing the roots at all you will have much greater success. Prune off any flowers and new growth to help alleviate the stress of the move. I usually prune each branch back to only a few leaves. 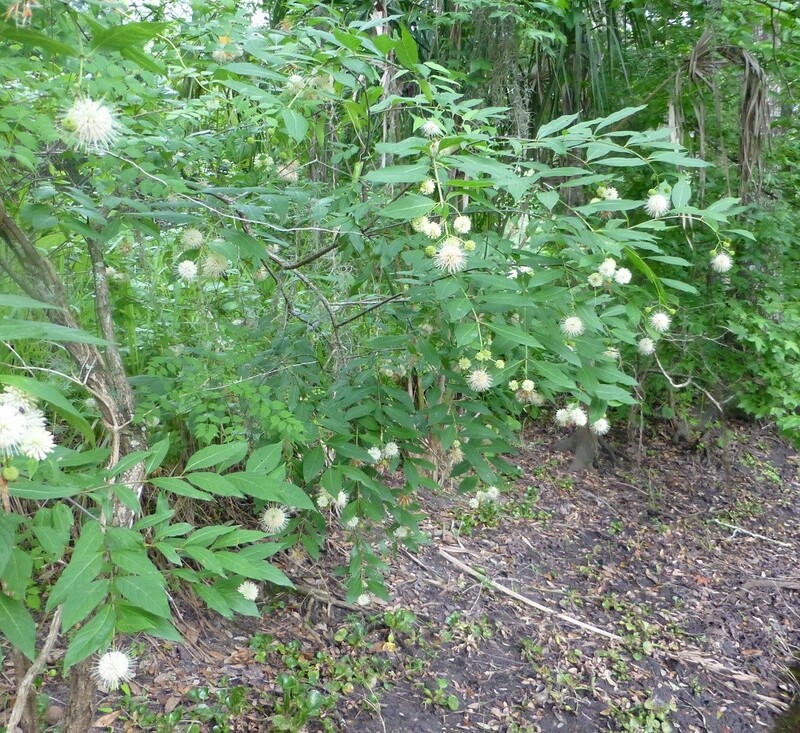 Buttonbush is a woody shrub reaching 10 feet in height. It grows in marshes, ponds, lakes and streams. It grows in full sun to part shade. The white, globe shaped, flowers appear in the spring, summer & fall. Many pollinators use the flowers including butterflies, bees, wasps and beetles. The seeds are eaten by songbirds and water fowl. The foliage is a larval food for the sphinx moth. Buttonbush is native to most of the United States. Swamp doghobble is a deciduous shrub that grows up to 12 feet in height. It grows in part shade and occurs in swamps, bogs and wet woods. The flowers appear in the spring. The flowers are a nectar source for bees and butterflies. Swamp doghobble is native to the eastern United States coast north to Pennsylvania south to Florida and west to Texas. Formerly known as Luecothoe. 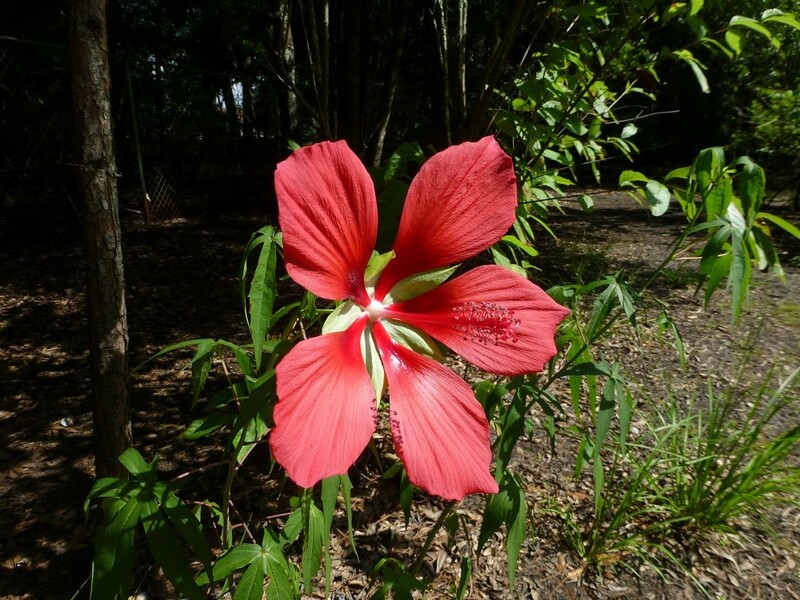 Scarlet hibiscus is a shrub like perennial wildflower reaching 10 feet in height. It grows in the full sun of swamps and wetlands. Large red flowers appear in spring, summer and fall. It is a nectar source for hummingbirds and butterflies. Scarlet hibiscus is native to the southeastern United States. Virginia willow is a deciduous shrub reaching 6 feet in height. It grows in river bottoms, wet woodlands, and along stream banks. The small white flowers are born on elongated clusters. The flowers are a nectar source for butterflies and bees. 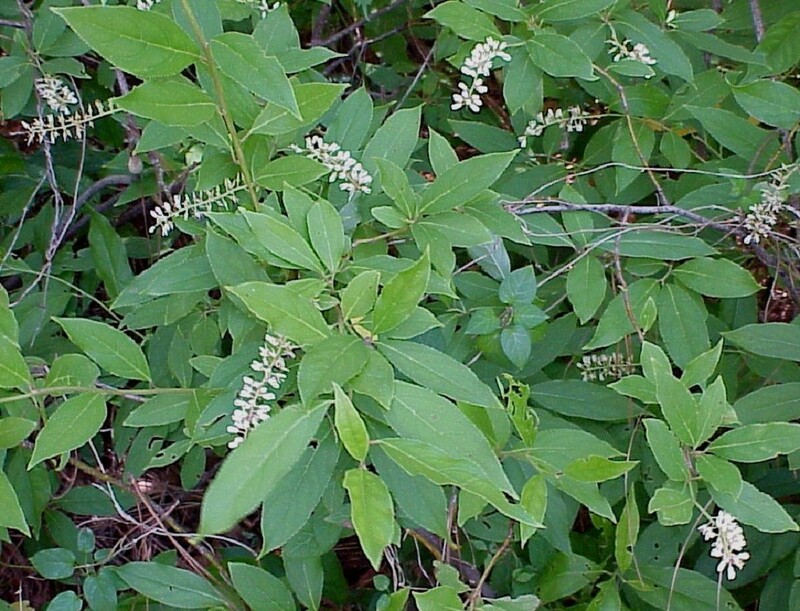 Virginia willow is native to the eastern United States north to Illinois, west to Texas and south to Florida. 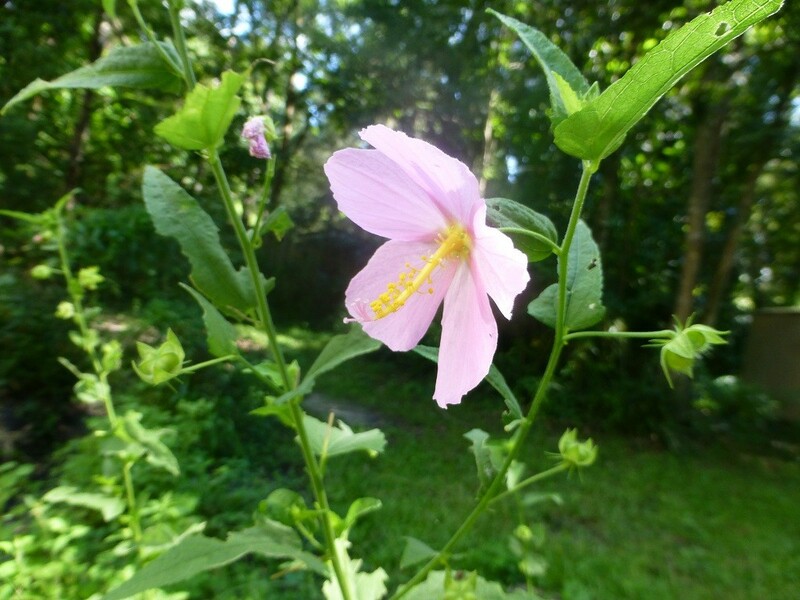 Virginia saltmarsh mallow is a perennial wildflower that can reach a height of 6 feet. It grows in full sun to part shade, but flowers best in full sun. It occurs in swamps and marshes in both salt and fresh water. The pink flowers appear in the spring, summer and fall.The flowers are a source of nectar for butterflies and bees. Virginia saltmarsh mallow is native to the eastern United States coast north to Pennsylvania south the Florida and west to Texas. Also known as Kosteletzkya virginica. 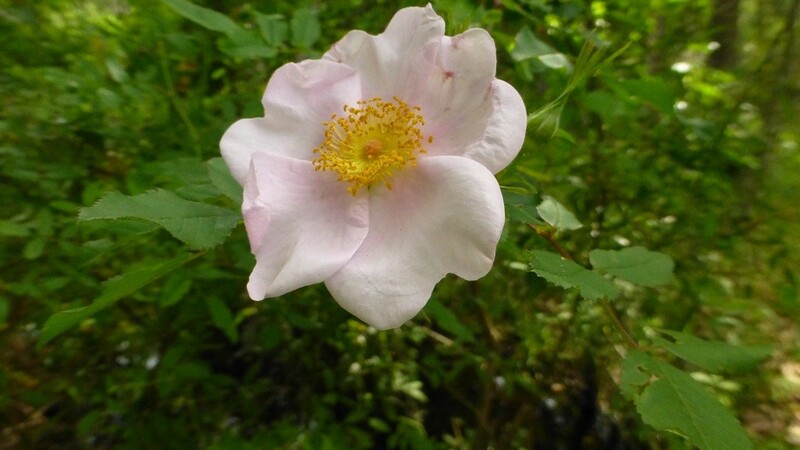 Swamp rose is a thorny, deciduous, shrub that grows to about 4 feet in height. It grows in the part shade of swamps, lake and pond edges, and along streams. The flowers appear in late spring and early summer. The flowers provide nectar for small butterflies and the rose hips are a food source for birds and small mammals. Swamp rose spreads by rhizomes. It is native from Florida north into Canada. 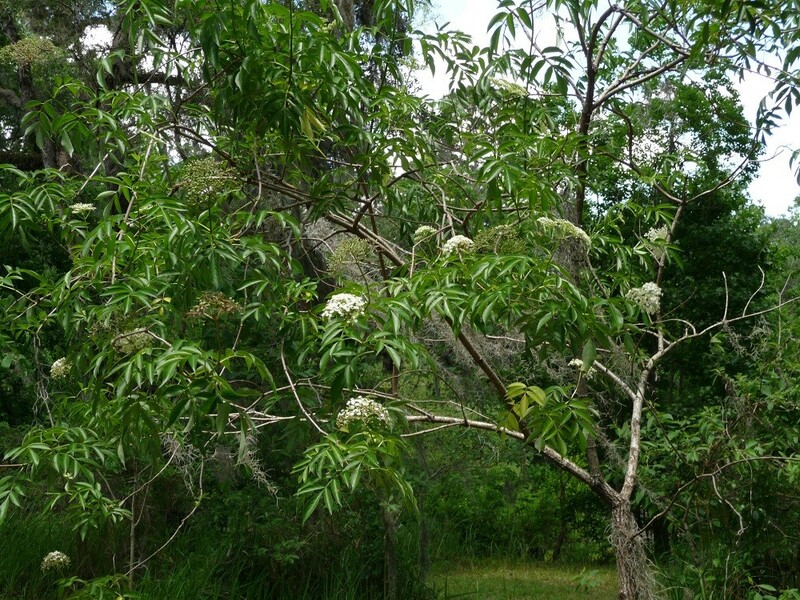 Elderberry is a deciduous shrub reaching 12 feet in height. It grows in part shade to full sun along stream banks, roadsides, and wet meadows. Flowers appear in the spring and summer. The berries are eaten by birds and mammals. The fruit and flowers are edible but must be cooked first. Elderberry is native to most of the United States. Buy elderberry root cuttings here. Wildflowers for wet sites are a wonderful thing. No need to worry about watering because they are in wet soils, they provide beautiful color, and nectar for the hummingbirds and butterflies, and some are butterfly host plants as well. 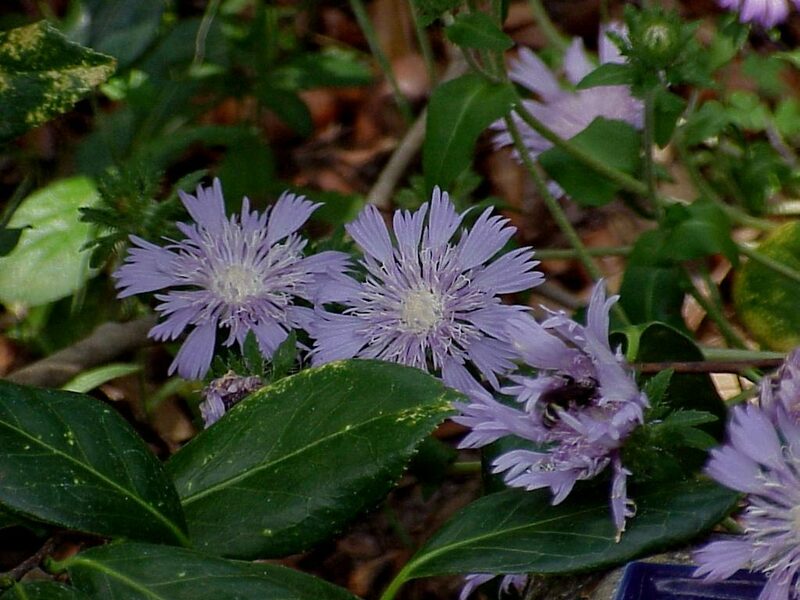 These wildflowers can be started from seed, root cuttings, and transplants. Transplant the same as you would shrubs. Swamp milkweed is a perennial wildflower that reaches a height of 2 to 3 feet. 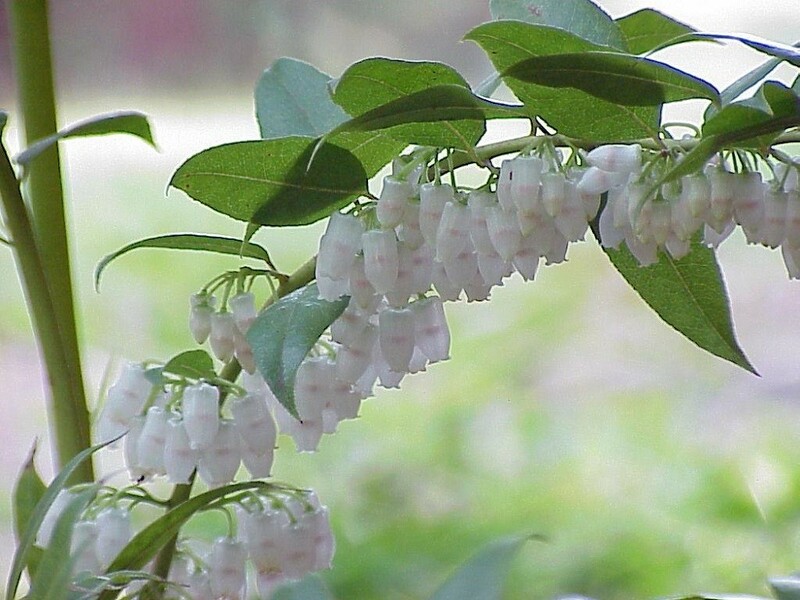 It grows in the part shade, and full sun, of swamps, wet woods and moist meadows. Flowers appear in the summer and fall. It is a butterfly host plant for monarchs, queens, and soldier butterflies and the flowers provide nectar for insects and butterflies. 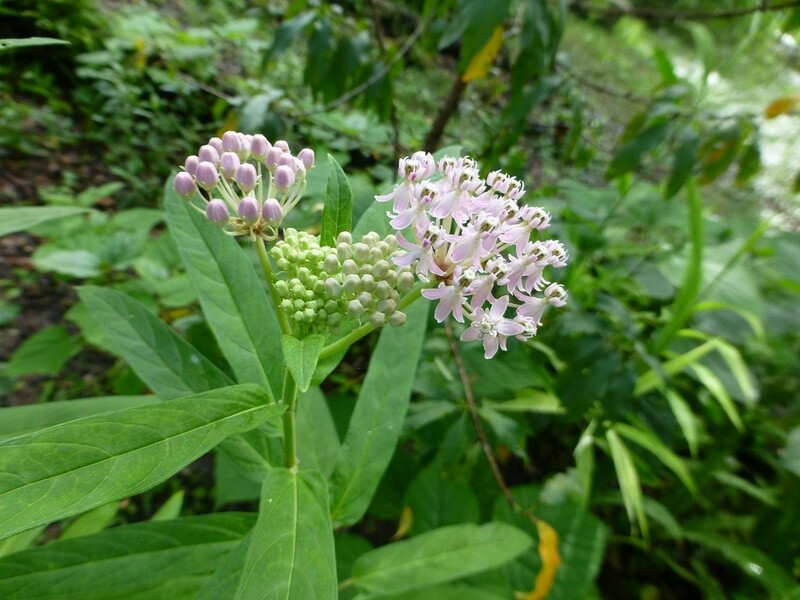 Swamp milkweed is native to almost every state. Golden canna is a perennial wildflower that reaches a height of 3 feet. It grows in marshes, pond edges, and ditches. The flowers appear in the summer and fall. It is a host plant for the Brazilian skipper and the large leaves are daytime resting sites for tree frogs. 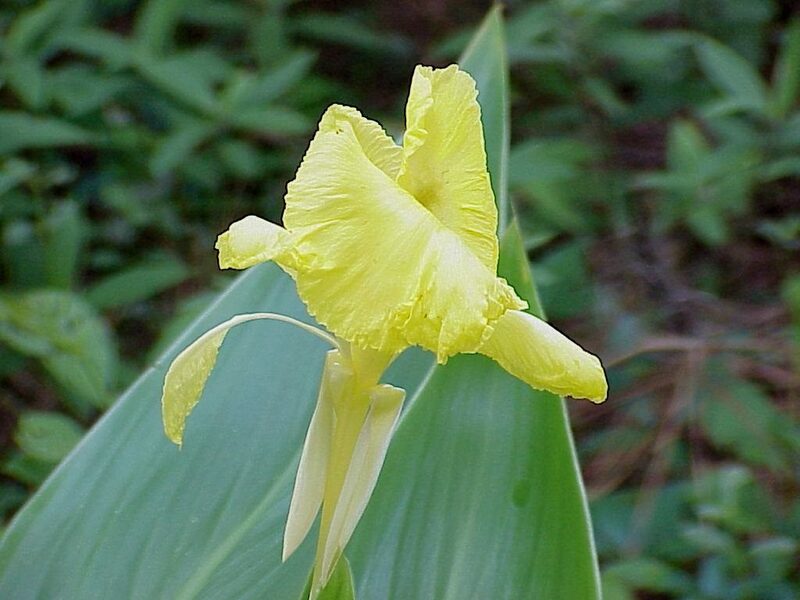 Golden canna is native to the southeastern United States. String lily is a perennial wildflower that reaches a height of about 3 feet. It is found in wet woods, swamps, and marshes. The flowers appear in spring, summer and fall and are pollinated by hawkmoths. 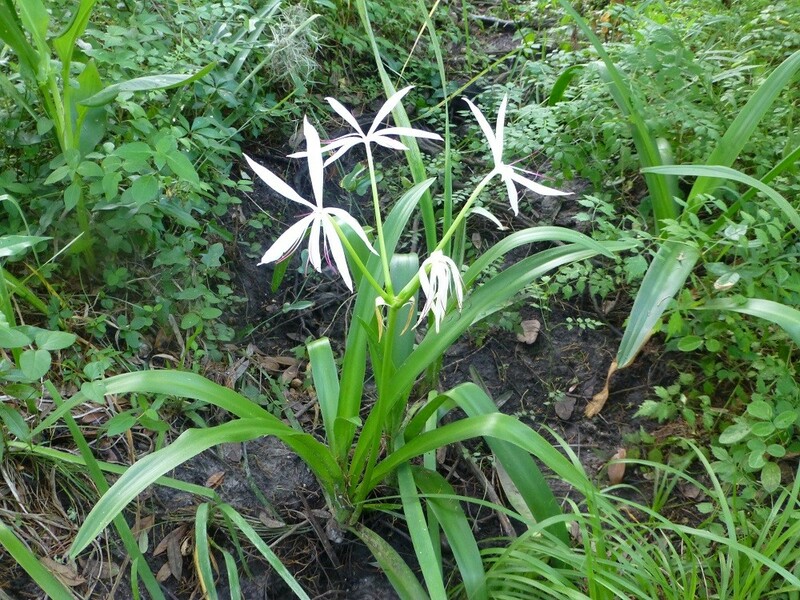 String lily is native to the southeastern United States west to Texas. 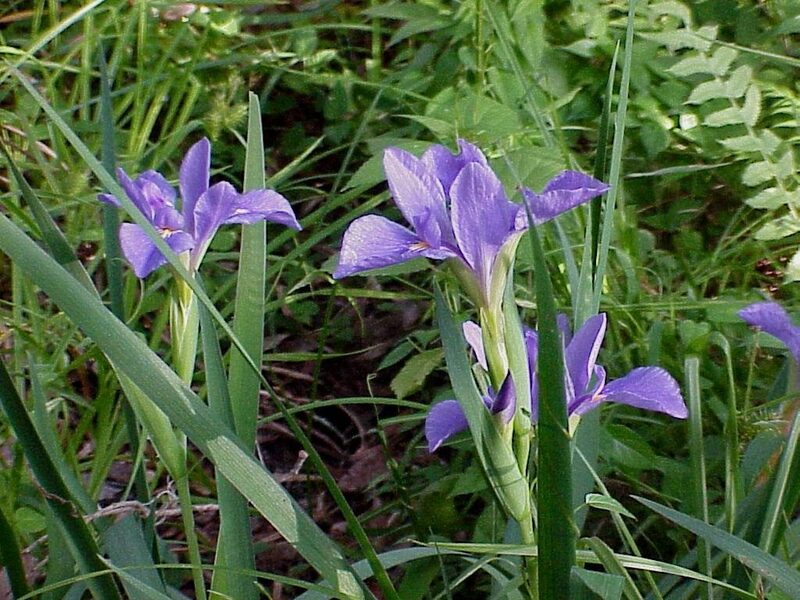 Southern blue flag is a perennial wildflower that reaches a height of about 3 feet. It grows in the part shade of swamps and wet sites. The flowers appear in the spring and summer and are favorite of bumblebees. Southern blue flag is native to the eastern United States. Buy blue flag iris seeds here. 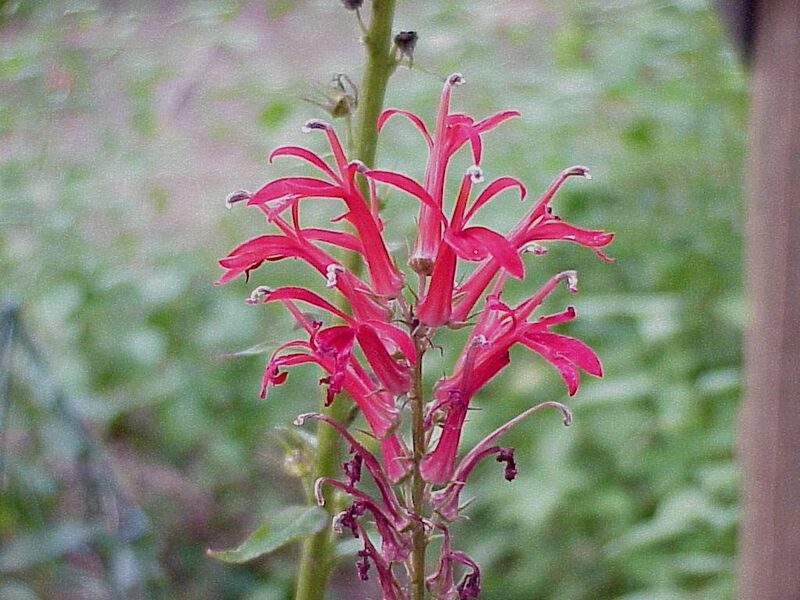 Cardinal flower is a perennial wildflower that reaches a height of 3 to 4 feet. It grows along stream banks, ditches and low areas. The flowers appear in the summer and fall and are a favorite of hummingbirds and sulphur butterflies. Cardinal flower is native to most of the United States. Glades lobelia is a perennial wildflower that reaches a height of about 2 feet. It grows in part shade in wet meadows. The flowers appear all year and are a favorite of bumblebees. 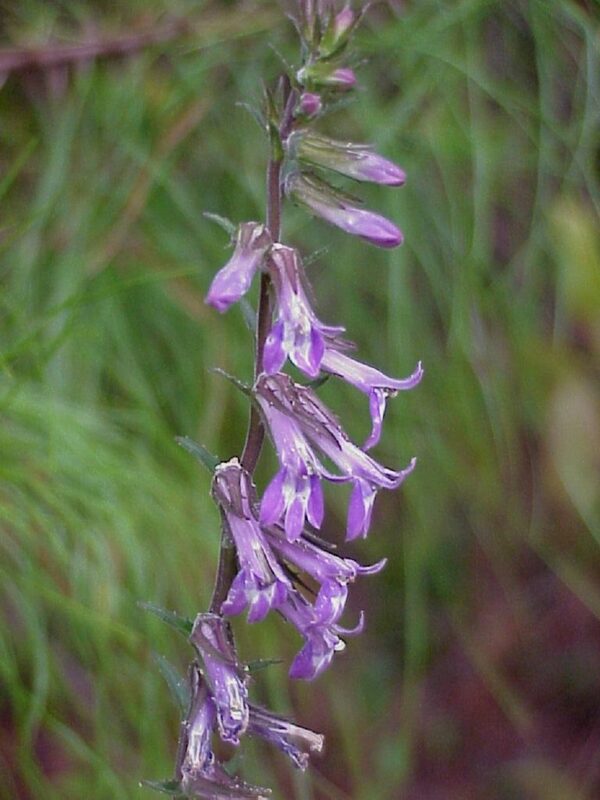 Glade lobelia is native to the southeastern United States.